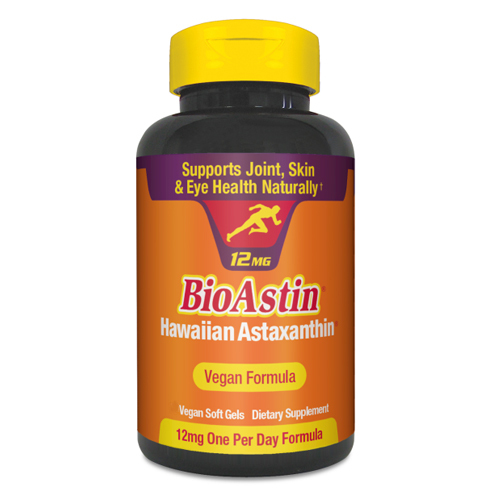 Nutrex BioAstin Vegan Hawaiian Astaxanthin has the highest potency levels of Astaxanthin per softgel available on the market today. 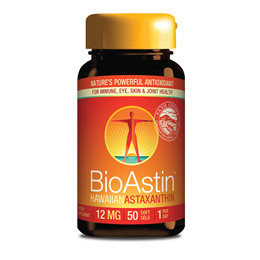 Astaxanthin is known as nature’s most powerful antioxidant. Natural Astaxanthin (from Haematoccocus pluvialis microalgae), Extra Virgin Olive Oil, High Oleic Safflower Oil, Non-GMO Modified Cornstarch, Seaweed, Glycerine (Vegetable), Sorbitol, Purified water, Natural Tocopherols (from Sunflower Oil). BioAstin is best absorbed when taken with food or a meal that contains fat. Below are reviews of Nutrex BioAstin Vegan Hawaiian Astaxanthin - 50 x 12mg Softgels by bodykind customers. If you have tried this product we'd love to hear what you think so please leave a review. I'm pretty sure that after I've been taking these for a while, my eyes get stronger, and if I go a while without them, the vision gets worse again. However, my wife finds no such effect, so it might be just me. Been taking these for about 3 months. I have difficulty swallowing the capsule, even though they are not big, buy I do have a problem with my throat. So cannot honestly say, if I can feel the difference. Only been taking for a couple of weeks but I can feel the difference, it does say at least 6 weeks.I have recommended it to others, and also recommended bodykind for orders. bodykind have always been a helpful company and their service is great. Only been taking this for two weeks but immediate effect on my 63 yr skin, quite amazing the degree of softness and I use a homemade she butter cream, it doesn't achieve what these have in a short space of time. Haven't really had time to appreciate other effects but I'm aware of good energy levels and I'm sleeping better. Superb product ! Highly recommended !